The storage box was just dropped off, and as he was finishing off showing me how to open it, the guy opened the doors, pointed inside, and said, smiling "This is where your life goes." Well, I hope it's not quite that dire a prospect. It's official, I'm now unemployed. Yesterday was my last day at Riptown, and it was a pretty good last day. We had 17 people for a delicious dim-sum lunch, beers in the sportsbook area at 3:30, and then I wandered around to say goodbye to everyone on my floor. Jeffery even poured me a small glass of scotch to toast with, which was a wonderful wrap up. There's a lot of people there that I'm going to miss working with, but who knows where the currents of life will take us all. After work, I finally went out and bought some new shoes. I need something that'll be comfortable enough to spend a good 4 days on my feet, once I get to London, but that are also nice enough looking that I can wear them with my suit for interviews. I seem to recall Ben recommending Ecco at one point, so that's what I ended up with. His recommendations are rarely wrong, I've found. 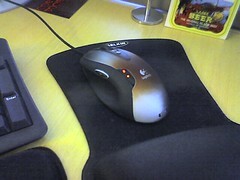 I'm still using vim, after all. My suitcase is also mostly packed, as of last night. I disassembled the last of my computer equipment, and packed what I need in my suitcase, along with clothes, and all sorts of other ancillary things. It turns out packing just one of my suitcases takes me to the 30lb weight limit for Zoom, so I'll be trying to return the other one, and the carry on, this morning. The carry on is also too heavy for Zoom's ridiculously low weight allowances. Now I'm just waiting for my storage box to arrive from ahsoeasy storage, so I can start loading it, and go run some errands. Yesterday, I had "Coding Challenge" to do. One of the companies that my recruiter had forwarded my CV to was interested, and I guess their standard practice is to give people an exercise to do. It was quite simple, and I finished it in 40 minutes. When I got a response back to my solution, they sounded very happy with it, and also said it was the quickest time they've had so far. Prior to that, I had actually been a little bit upset that it had taken me so long to finish such a simple exercise, but now I'm not so upset. They're talking to my recruiter now to schedule a face to face interview. That'll bring the total of face to face interviews up to a total of four. Exciting times! I also scheduled time on the evening of the 2nd to go look at the flatshare I'm interested in, and meet the people there. If everything works out, I could be employed, and have a place to live, all by April 9th. That would be awesome. My third and most recent interview was a bit of a flop. Everything's great on the technical side, but they're looking for someone to build up a new London office, and be more of a team lead. I'm looking for a more technical position though. I write software because I love doing it, and I don't want to end up trying to manage people instead, because I'm not good at it, and don't enjoy it. Although that interview didn't go so well, my other two have scheduled F2F (face to face) interviews for Thursday the 3rd of April. This past weekend was theEaster long weekend, and I was up in Kelowna to see my family. It was my last opportunity to see my sister and my grandparents before I fly to the UK for an indeterminate length of time. 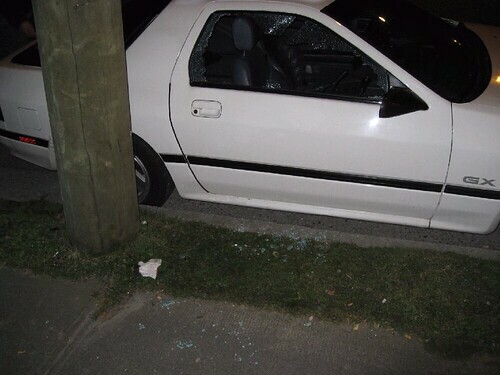 It also marked the weekend I'd be giving my car to my parents to look after while I'm gone. I wanted to get one last good drive in, so I took the Hope-Princeton highway there, via Keremeos. The weather was decent (no snow, little rain), the traffic was light, and the car was just purring. It took me 6 hours on the nose, with a couple short stops to fill up my stomach and the tank, and to empty my bladder. It was pretty much the perfect drive for the last trip with Bianca for a while. For the way back, I caught the bus to Hope, where Chris picked me up, and we went for a tasty home cooked meal at the Hope Drive-In & Restaurant. After driving back in to town on Highway 7, to avoid traffic, we went to the Town & Country, our usual haunt, for some bowling, and to say hello (and goodbye) to Erica. My back had been sore all weekend, but I decided to bowl as a semi-cripple anyway. We bowled three games, with Erica joining us for the last two, and on the last game, I scored 193, which is an all-time high for me, at 10-pin bowling. Now I'm home, and back to work, and packing, and cleaning, with only 7 days left before I fly away! Exciting! I just aced my 2nd interview. The CTO of the company was the one interviewing me, and he's a developer. He says the only difference between him as CTO and the other developer there is that he has to fill out the year end reports. Other than that, he's just a developer. It was an interesting interview, because he said he doesn't like doing telephone interviews, because it means we can't draw on whiteboards and such, so we ended up just more or less having a 20 minute chat. We just talked about the technology they're using, where he wanted to just hear my thoughts on it, asked me what I thought of J2EE, both pros and cons. At the end, he said he's definitely interested in interviewing me once I get to London. Yay! I had my first telephone interview today. My recruiter at client-server.com has 4 interesting jobs he's forwarding me for, and this was one of them. After our 20 minute interview (with a project manager, not a technical interview), almost half of which was spent answering my questions, she said she'd like to have me come in for an interview once I arrive in the UK. 1 for 1, so far. I have another interview tomorrow morning, which I hope (and expect) goes just as well. Never in my wildest imaginings did I think things would go this well! Last night after work, I went down to the Cambie for one last night of pitchers of winter ale. It was quite busy when I got there, which was unusual for the hour, but I realized that I had forgotten it was St. Patrick's Day. I found a table with only two people at it, and asked the guys if my friends and I could join them. When I heard their accent, I asked them if they were from the UK. It turns out they're both from Rugby, and are here traveling, separately, and met up for beers. What a great coincidence. Quy and Cam, a couple of my co-workers, showed up a little while after Jenn, and we all had a good time drinking beer, and some of us having burgers, before we called it a night. I'm glad I got to go back one last time. I was supposed to have my first interview this morning, but unfortunately, due to the time difference, the time didn't get confirmed with the company, so they had to reschedule. It's confirmed now for tomorrow at 8am. I'm so excited! Today's been a rather momentous day. First, I booked a flight to London for March 31st, then I quit my job. Plans for sending me to the new Spanish office haven't progressed the way I had hoped, and I feel a little bit like I've been jerked around, or at the absolute least, not communicated with very well. As a result of that, and other happenings in the company that I'm not very happy with, I decided it was time to close the book on the "Spanish Saga", as my dad has nicknamed it, and go ahead with my original plan of moving to the UK. I posted my resume on monster.co.uk on Wednesday night, fired it off to about 10 different job posts, and by the next morning, I had 6 replies from recruiters who were interested in placing me in various positions. The rapidness of the response, as well as the volume, convinced me quite quickly that I shouldn't have any problem finding a good job over there. Luggage, originally uploaded by Xenoc. New luggage, yay! I bought the maximum amount and size of luggage I'm allowed for both checked and carry on baggage, so I can take as much of my "stuff" as possible when I move to Europe, without having to ship stuff over. If I'm lucky, I won't need to actually ship anything, because I think I can cram everything that's important to me into these two hard cases and carry on. 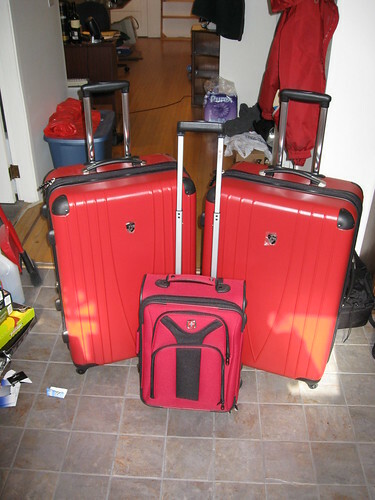 They're also nice and light, so I can fill up the weight limit with more actual stuff, instead of just heavy luggage. 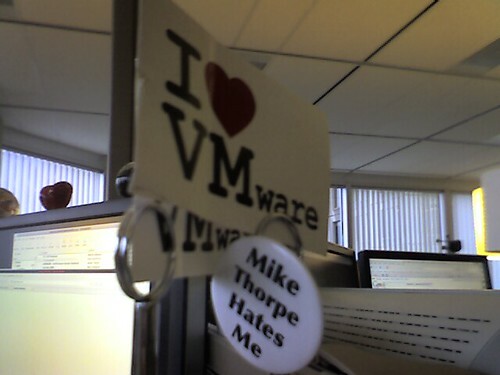 I love Vmware, originally uploaded by Xenoc. Blogging this from flickr website.